The use of parachutes when jumping off a plane has been customary. It’s natural to rely on these devices to get you down on earth in one piece, even Evel Knievel used one. However some people are not thrilled by skydiving anymore. It was just a matter of time before someone pushed the limits of aerodynamics and parachute skydiving. Enthusiasts have found a way to jump off the plane without the use of parachute. Continue below. Using the flying squirrel as a model, skydivers are now attempting to disembark from a plane and land safely on the ground without a parachute. Many consider this as dangerous but tests are still being done around the world. The technology is still being developed and designers refuse to divulge their own idea due to competition. Jumping off an airplane without a parachute is practically stupid but many skydiving enthusiasts are all competing to be the first one. 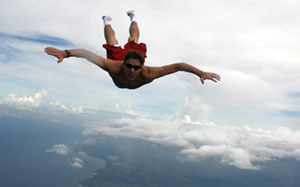 Skydiving has been a common parachute sport today. Skydivers are willing to push the limits for a world record. Some skydivers have come up with their own design to enable them accomplish the feat. 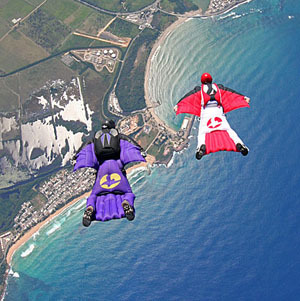 Skydivers are attempting to land by using a wing suit without the use of a parachute. Wing suits are not new. A safer modern version has been created in 1990 by Patrick de Gayardon. Since then it has been put to use by enthusiasts with the aid of parachutes. Using the wing suit and landing without the aid of parachute is almost akin to flying which has inspired many skydivers to push their abilities to the test. The trajectory is vertical as compared to the usual skydiving which is horizontal. The wing suit has nylon woven tightly between the legs, arms, and torso. This creates wings that get filled with air and produce lift. The suit allows forward movement and aerial maneuvers while slowing down to descend. Jeb Corliss, a BASE jumper, have designed his own wing suit that he thinks will enable him to land without a parachute. Currently he is still testing his design but hasn’t made any attempts to actually land using it. The first test involved jumping out of a plane, making a 270 turn and then re-enter the aircraft. Unfortunately the first test didn’t do well; he missed the plane and was forced to land with a parachute. He plans to get funding and make the first landing on a runway that he will also design. The design will borrow from principle behind Nordic ski jumping. Another designer has also made her own prototype wing suit. Maria von Egidy cannot test the suit herself so she employs skydivers to test them for her. She is also looking for funding and is still working on a way to land the pilot safely. The main problem with wing suits is landing. Pilots can slow down vertical descent by 30 miles an hour but they are moving 75 miles per hour forward. Even though a pilot can manage to slow down their descent any wrong movement can be fatal. Mr. Corliss plan is to slide down while von Egidy is planning to create a form of forward brakes. For now landing without a parachute is still in the works. Individuals may have to settle themselves with skydiving for now before they can glide through the sky like a flying squirrel. Jumping out of a plane without a parachute is not something we recommend but that’s exactly what B.A.S.E. jumper Jeb Corliss has been doing to help pave the way for the world’s first landing attempt without a parachute. Up to now, he’s been testing speeds and fall rates in the wing-suit so that he can determine what’s required to be able to land the wing-suit without a parachute. Corliss and Go Fast! – sponsored test pilot Luigi Cani teamed up to gather the data. Jeb flew in free fall donning a parachute alongside Luigi, who was at the controls of the world’s smallest and fastest parachute-known as the ICARUS VX-39. The two were able to gather data using GPS systems attached to Luigi that tracked exact forward speeds, exact fall rate and the glide angles so the calculations could be done to determine what apparatus would be needed for a safe landing. No-one has ever survived a landing attempt without a parachute but Corliss is adamant that he has four technologies under development that will enable him to land safely without a parachute some time on 2005, though he has not yet disclosed these technologies to the media. “We found there is a definite and reasonable speed for a landing attempt sometime next (northern) summer. We’re now developing four different types of technologies to land safely-it’s very important to land with zero injuries,” said Corliss after analyzing data from the test flight. Showcasing the evolution of the sport of skydiving, Luigi Cani remarked on the uniqueness of Jeb’s wing-suit project. “The testing shows the technology of the sport-nowadays we can jump a parachute that flies as fast as a person in free fall and currently we’re discovering technology to land a wing-suit without a parachute,” said Cani. “If Jeb lands the wing-suit without a parachute and survives-he is going to be my hero,” added Cani. The project is being sponsored by Go Fast Sports & Beverage Co., the producer of Go Fast Energy Drink and Go Fast Sports Apparel.